Thank you to Chris Mello for making our first Olympic Lifting session a runaway success. We were junkyard dog aggressive, jumping, landing, rolling, lifting, and pulling our hearts out. The one hour of Oly lifting mayhem will continue Tuesday nights at 630 pm. 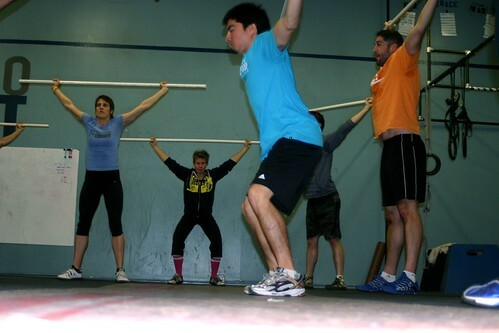 It’s common knowledge that before people can join On-Ramp they must attend our CrossFit 101, where they are given a real world, albeit scaled, WOD. Our CrossFit 201, while not out-and-out mandatory, is highly recommended for those who have finished On-Ramp, who have been in On Ramp for several weeks, or just athletes who have been CrossFitting for a while. It covers the hows and whys of CrossFit, and introduces those weird Zone/Paleo concepts to nutrition that everyone seems to be talking about. The 201 happens this Sunday evening at 6pm.